China has an opportunity to skip mistakes that the US and other countries have made when it comes to tackling air pollution and climate change. That is one of the main themes coming out of this week’s Air Quality Workshop in Beijing, which brought together 80 international and Chinese experts and officials from China’s Beijing-Tianjin-Hebei (“Jing-Jin-Ji”) region. The Workshop was co-organized by the Paulson Institute and the China Center for International Economic Exchanges (CCIEE). The most important lesson, according to the experts, is “co-control,” meaning simultaneously fighting air pollution and dealing with carbon emissions that cause climate change. When the US first began tackling air pollution in the 1960s, climate change and global warming were not yet part of everyday vocabulary. Carbon reduction was not included as part of the clean air conversation, which focused almost exclusively on traditional air pollutants such as PM2.5, sulfur dioxide and nitrogen oxides. But today, the cutting edge approach is to tackle both. 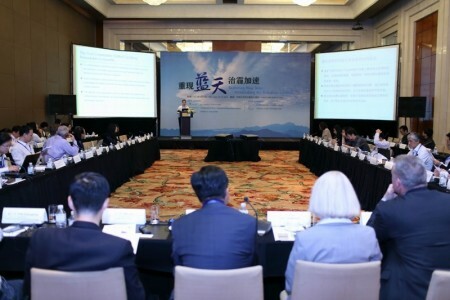 In the coming weeks, CCIEE, the Energy Foundation, and others are preparing documents with the help of feedback from the workshop that will support policymakers prepare for the new air law that will take effect on January 1, 2015, as well as deal with enforcement and implementation of environmental policies. Many of the experts at the workshop have already made significant contributions to air quality policy in China and will continue to serve as resources for local Environmental Protection Bureaus (EPBs) and national policymakers. Is Zhou Yongkang's Downfall Good for China's Environment?